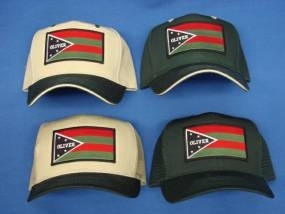 Oliver Flag Logo, Embroidered Patch, Applied To Good Quality, High Crown Hats, One Green/Khaki Solid, One Mesh, One All Green Solid, One Mesh, All have Adjustable Closure. One Size Fits Most. "GOOD DEAL!"